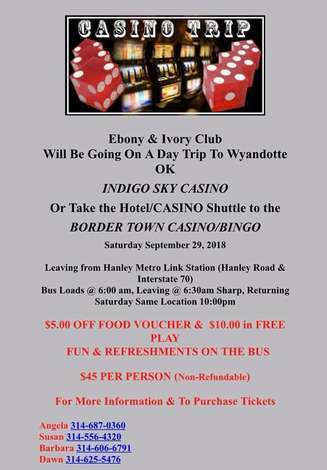 Ebony and Ivory Club are going to Indigo Sky Casino in Wyandotte OK on Saturday, September 29th. You can visit Indigo Sky Casino or take the shuttle to Border Town Casino/Bingo!! Leaving from the Hanley Metrolink station at 6:30am sharp. Returning to the same location around 10:00pm. $5.00 off food voucher and $10.00 in free play!! Fun and refreshments on the bus!! Tickets are $45.00 and non refundable.